It is no secret that I'm a compulsive doodler, and I love a good challenge and a reason to do a large doodle. So I recently made three gifts by/for family relatives. One was a gift from me, and the other two were 'commissioned' by a family member for her adult children. I wanted to share the results with you. Sorry the photos aren't great; I don't really have a good setup for photographing artwork in my home and its frustrating. If I try to make the mat look bright white (which it is), the drawing colors look washed out to me. Plus some of the markers are metallic, which is tough to photograph. Anyhow, the pics above are a couple of closeups. The entire pieces can be seen below. For the first two below, I was given a list of items and names to include, and the rest was up to me. The required items were a challenge! Celtic knots and crosses, unicorns, lions and tiger - none of these things are typically in my 'wheelhouse'. I did the one below for my adult stepdaughter and her family as a gift from me. Because it's already framed in this shadowbox frame, it doesn't photo well at all. And here's the other two, in their frames. My medium of choice for these sort of doodles is Flair pens, a black Sharpie, and some wonderful metallic gel markers. I don't usually pre-draw with pencil, but I did need to do that for the Celtic knot and cross, the lion and tiger, and the unicorn. Let the Force be With You this Holiday Season! Yes, it's Princess Leia in gingerbread. Let me explain. It is that time of year, when I spend a good deal of time focusing on a major art project, knowing that the results will all be eaten within a little more than a week's time. I broke out the cookie cutters (I even bought a couple of new ones), got out my husband's mother's gingerbread recipe, and turned our kitchen into a gingerbread cookie factory. 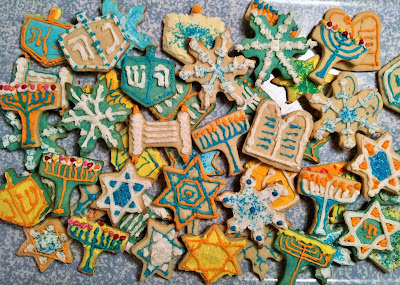 After more than 7 hours of decorating over 7 dozen cookies, the cookies are done. Before baking, I cut some windows out of some of the houses. I didn't know what to do with the leftover teeny hunks of dough, so I baked them. When the cookies had baked, it was obvious that a couple of the hunks of dough looked just like Princess Leia's hairdo, so with a little royal icing, Leia became a gingerbread reality! Another lump became the blond beehive (below right) and a weird-shaped piece became my favorite, the crazy orange hairdo on the left. The windows were cut out of some of these houses and also out of the train locomotive. It's hard to see in the photos, but crunched up Life Savers were baked into the openings, and they melt and harden into little stained glass windows! The train, by the way, is made from some new cookie cutters that I purchased on a whim. It's my first time using the cutters and I rather like the result. I also used the snowflake cutter a week ago while making Hanukkah cookies. I have a giant gingerbread man cookie cutter I used to make the three dudes below. Below are the more 'usual' size gingerbread menfolk. Note the kid with the curly red hair - his hair is also an add-on of an extra hunk of dough. The shape of the dough could also have become an awesome football helmet, now that I think about it. Oh well, maybe next year I'll decorate with professions - football players, doctors, ballerinas, explorers, teachers, artists, pirates, firemen... Ooh I really like this idea! And here's all the womenfolk. The white bun on the gal in the bottom row is also a dough add-on. My small 'boy' cutter can be turned upside down for cute reindeer faces, as well as the little boys. By the time I got to decorating the boys, I was out of patience and time. I have no idea why the baby on the upper left appears to be wearing a diaper made out of a double-ended carrot. It definitely wasn't intentional! Let the Force be With You, and Live Long and Prosper! Thanks for stopping for a visit. I hope you have some artsy things planned for this holiday season! If you would like to see last year's gingerbread ridiculousness, including a gal in a polka dot bikini, you can check out the last year's post about them, HERE. This post isn't actually about the Bling table, but I can't write about the convention without mentioning this activity. I'm proud to say that the Bling Your Badge table was my brainchild about 1/2 dozen years ago, when the convention was going to be in our region for the first time in a while. I thought art teachers would like something to occupy their hands during their spare moments. And boy was I right. The table has been so immensely popular that we sponsor it annually, no matter where the convention is held, and I'm the gal in charge. It is so popular that, before dinner and the evening events I'll unplug and hide the glue guns and power strip, and clean up the mess of spilled rhinestones and pipe cleaners and wiggle eyes and close the containers, and I'll come back an hour later and find the glue guns all plugged back in, with the containers open and feathers and sequins sparkly foam stickers and such again spilled out all over the table. Art teachers are persistent about wanting to fancy-up their badges! It's hard to get angry when you've made so many people at the convention have a happy smile. The masks pictured above use a paper lunch bag armature, and the cats below use a plastic grocery bag armature. The bags are, of course, stuffed with crumpled newspaper. And of course that's me with slightly blue hair doing my presentation. If you want to know about the eyeball in the background, you can read about them in the blog post you'll find by clicking HERE. By searching my blog you can also find info on the various projects pictured in the images bleow. The delicious ice cream cones pictured below are made from a newspaper ball armature, on top of a paper or oaktag cone. Easy papier-mache project and oh-so-fun! We discussed much more in the workshop, but since I wasn't the person taking the photos, this is all I've got. But that's OK, because if you want to know everything about the workshop, my handouts and PowerPoint are available for you, with all sorts of advice and instructions for using papier-mache successfully! Here's a link to my papier-mache handout from the convention workshop: Get Stuck on Papier-Mache - handout. For links to my PowerPoint from this workshop, or various other documents uploaded from previous workshop presentations, including instructions for several papier-mache projects presented in a workshop at NAEA 2016, you can find them by going to my 'Document Weblinks' tab, which is located HERE. The PowerPoint document has not been uploaded yet, but hopefully will be tonight. In the meantime, there's a link to my PowerPoint from NAEA 2016. The documents available through these links are available for your benefit and to help inform your teaching, but I ask that you please acknowledge my ownership of them and not copy or share them publicly. You are NOT free to share my PowerPoint in a class or workshop without my permission. Thank you. Note: I still have more to share about the convention in another upcoming post! Just before Thanksgiving, I returned from my NY state art teachers annual convention, a whirlwind weekend of learning, creating, presenting, engaging, and more. 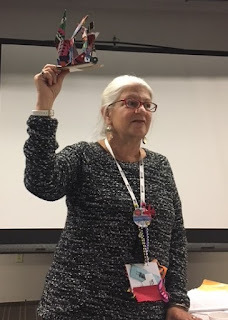 While there, I presented two workshops; I'm going to tell you about one of them in this post, and I'll tell you more about the convention and the other workshop in another post. The workshop I'm telling you about today was called From Scraps to 3-D Success, and I co-presented with a friend (pictured below). We each presented one project made mostly with recycled materials; my project was an abstract sculpture made entirely from cardboard and Elmer's Glue-All. 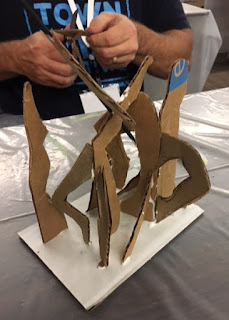 The photo at the top of this post, and the one directly below, are examples of these cardboard sculptures, made by participants during the workshop. We began with 4"x 6" rectangles of cardboard, cut from shipping cartons. I also provided a big bagful of random shapes of cardboard cut from shipping cartons. All cutting was done on an old paper cutter to get straight edges. It works great, and is fast and easy to cut a lot. Participants were each given a Popsicle stick, to be used as a 'glue paintbrush', and little cups of Elmer's Glue-All to share with a neighbor. However, when I do this project with students, I do NOT put the glue into cups; the students actually pour a little puddle of glue directly from the bottle onto their cardboard base, near to the corner. This prevents them from using too much glue. Using too much glue does not make the structures hold together better! In fact, too much glue means it takes longer to set and therefore the sculptures are more difficult to construct. The small cardboard pieces have at least one cut edge that has zigzaggy corrugation, and another edge where the cardboard is more like two parallel lines. The zigzag edges will hold much better and I recommend using those edges for gluing/attaching when possible. We scoop up a little glue with our pop sticks, paint it on the edge we plan to glue, and hold it in place where desired, counting AT LEAST to 10. For more challenging structures, count higher. While the glue does not dry totally in 10 seconds, this allows it to set enough for you to let go. Usually I would have students glue a base structure in one class, and then add to the construction in their subsequent class. In this workshop, I had participants set their sculptures aside to work to the project offered by my co-presenter, and then come back to the cardboard sculpture to add more pieces. Hold and count to 10!! It's possible to hold some crazily balanced pieces if you are patient! Note: the glue MUST be Elmer's Glue-All, which is very strong. If you use Elmer's School Glue, the sculptures will collapse. Don't bother to try; it will be a waste of time and your students will get frustrated when their work begins collapsing. Some workshop participants had time to paint their little sculptures. One workshop participant said she was going to have her students paint large pieces of the cardboard in a 'painted paper' type of activity, BEFORE she cuts the cardboard for this project. It could work great, if the cardboard doesn't warp too much. I look forward to seeing her results. Below, a participant painted hers a solid color. Behind it is a piece of painted wood for the project that was presented by my co-presenter. And one gentleman got really inventive, cutting the shapes into curves, while leaving straight sides for gluing. Ironically, this same guy attended a papier-mache workshop I taught years ago, and totally went in his own direction then, too! I even mentioned him in a blog post about the workshop, HERE. I've done this project many times over the years with my first graders. We discuss what a sculpture is, and what it means to be abstract or non-objective. Sometimes their sculptures turn out to look like castles or robots or airplanes etc and that is fine too! We discuss that a person who makes a sculpture is a sculptor, and that they are all sculptors while doing this project! We look at photos of work by various artists, in particular Calder, but there are many others that can directly relate to this project, depending especially on how you intend to paint the finished products. In the blog posts from 2011 and 2012 that you'll find HERE and HERE, you can see some examples of my first graders' cardboard sculptural creations using this process. Here's a first grader working on his sculpture, paying attention to balance, and another first grade piece. If you're looking for an easy, low-cost project that will work at almost any grade level, give this one a try! Sculpture with kids is really fun! I came across a really cool post on the Italian blog Arteascuola, and decided to adapt the project to use with my after school DragonWing Arts students. Thank you to blogger Miriam Paternoster for her great idea! You can find her post, HERE. There were three parts to creating the final project. But before we even started, we discussed surrealism and and looked at images by various artists. We noticed that many of the paintings created a sense of space and depth by using perspective. So of course we had to discuss what linear perspective is! Then we were able to start. Step 1 was creating the background, and outer space sky. We painted with black ink, and let it dry. Then we painted on some glittery purple paint (it was a free sample I was given at a convention, and the consistency is rather thin and jelly-ish and doesn't cover well at all, but it create a nice effect great over black). We also splatter painted some white tempera paint. When it was dry, metallic and glittery markers and colored pencils were used to add some planets and stars and such. Step 2 was to create a simple room interior on a separate paper, using one-point perspective. We used the vanishing point and our rulers to create a checkered pattern on the floor, and also to place some doors and windows. The rooms were painted with liquid watercolors, and salt was added as desired o make a funk textural look to the walls and floor. When the paint was dry, some details were added with Sharpie, and the windows and doors were cut open. Some were cut out completely, and others were cut so that they could open and close. The ceilings were completely cut away. Here we are, ready to cut out our ceilings and doors. The Sharpie embellishments haven't been added yet. Step 3 was assembly and magazine collage. The parts were glued together, and students picked images to put in their rooms and skies. I was originally planning to cut a window flap in the skies, and take and print photos of the kids so they could be entering through the window. Thank goodness I didn't tell the kids about this plan, since we ran out of time and never got to it! The pic below shows the work created in steps 1 and 2, ready to be assembled. The pics below are the finished pieces, after the magazine collage was added and everything was glued together. (We used Elmer's Glue-All applied with a paintbrush.) The pic at the top of the post is another of the complete pieces. I have just 4 kids in the class this fall, which sometimes makes an odd dynamic. I had great expectations for the kids putting things like giant hamburgers or ice cream cones or insects or tubes of toothpaste in the room or in the windows, or a fish flying through the sky, and so on. I made an example with a giant foot coming through a door, and a large hand reaching in a window, as well as a huge eyeball and a lizard, and a chocolate chip cookie. I had loads of magazines - nature, home, and more, and so I was very surprised at the odd choices the kids ultimately made. I've been teaching a long time, and usually kids would have been intrigued by my example but these kids had other ideas, decidedly different from my expectations. But I think they are pretty cool, nevertheless!! !